In a bid to book their spot in the final, France will take on Belgium in the first semi-final of FIFA World Cup 2018 at Saint Petersburg Stadium in Russia tonight. Later on Wednesday night, England will face off Croatia in the second semi-final at Luzhiniki Stadium. The match between France and Belgium is poised to be the most sensational one of the tournament as both the teams have produced outstanding performances in this year’s World Cup, reports ESPN. Belgium’s so-called golden generation have fallen short in recent tournaments, but their destruction of the Brazilians in the quarter-final was the performance of a team that believes it can become world champions. France, who laboured through their group with only three goals in three games against Australia, Peru and Denmark, showcased their incredible depth of talent when teenager Kylian Mbappe led their second-round mission dismantling of Argentina in Kazan. 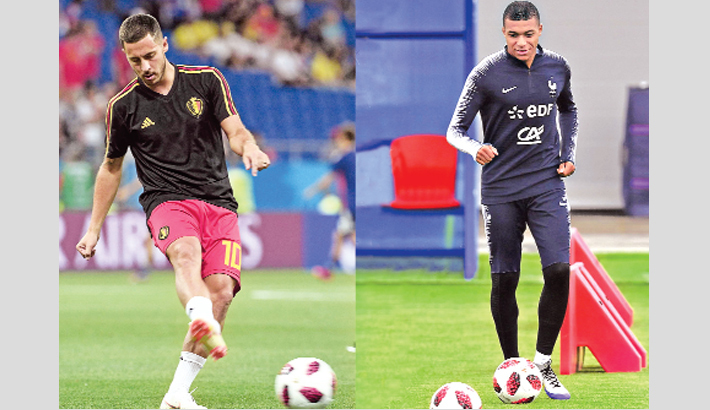 Mbappe, Ousmane Dembele, Samuel Umtiti, Paul Pogba and Antoine Griezmann will almost certainly all be around in four years’ time, but for Belgium, this World Cup has to be their moment. With so many players in or approaching their 30s, Roberto Martinez’s men have to grasp this opportunity or risk seeing it evaporate forever. But Belgium who are led by outstanding efforts from Eden Hazard, Kevin De Bruyne and Romelu Lukaku were so hot against Brazil, they go into this game against their big-brother neighbour as favourites. France have the greater pedigree being the winners of 1998 World Cup and finalists in 2006 World Cup but Belgium are the team that seems to have come together at just the right time in Russia. The Belgians, having kept Neymar quiet during the quarter-final against Brazil, must find a way to do the same with Mbappe, but Vincent Kompany’s return to fitness ensures that Martinez can rely on the Manchester City captain’s experience to marshal the defence. France, in turn, have to find a way to nullify De Bruyne and Hazard, but the Belgians possess more match winners. Later on Wednesday night, the world will witness a semifinal matchup which looked very unlikely at the start of the tournament; Croatia and England now stand on the verge of the World Cup final after negotiating a favourable route to reach this stage of the competition. England have eliminated Colombia and Sweden, while Croatia looked rather impressive after topping their group with three victories, were taken to penalties by Denmark and Russia in the knockout rounds. But having twice endured the draining yet ultimately successful ordeal of extra time and penalties, the big question over Croatia going into Wednesday’s semifinal will be how much they have left in the tank. He should break up the attacking midfield trio of Jesse Lingard, Raheem Sterling and Dele Alli to accommodate an extra holding midfielder (Eric Dier) to help snuff out the threat of Luka Modric.